Living polymerization is a very important type of polymerization permits the construction of homo- and co-polymers with controlled molecular weights and narrow polydispersities. In addition, living methods permit the construction of block copolymers with tailor-made architectures. 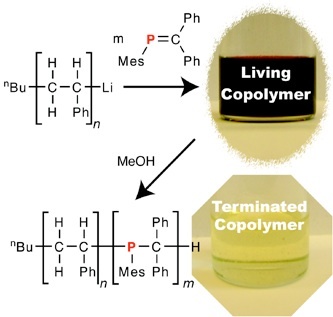 We have shown that poly(methylenephosphine)-block-polystyrene can be prepared and kinetic studies have shown the living anionic polymerization of P=C bonds is several orders of magnitude slower than the analogous reaction for C=C bonds. Importantly, this is the first ambient-temperature solution polymerization of P=C bonds and it opens the door to many exciting possibilities in phosphorus polymer chemistry.